← My Wife: Master Motivator or Manipulator? Ever since Savannah was a little puppy she’s had a camera in her face. If I didn't have this picture no one would believe she was THAT small. I can’t even begin to put a number on how many pictures I’ve taken of her, but I do know I’ve done it so much that Savannah won’t look at me when she sees me with my camera. 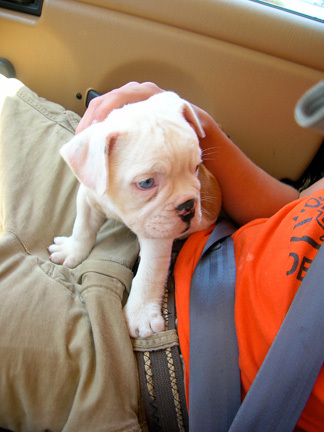 I couldn’t even wait for her to get home to start taking pictures, snapping a few while Jake held her on her first day home. For the first few months I took pictures of her doing everything and I mean everything. I’m pretty sure I’ve got shots of her peeing, but I’ll spare showing you those. 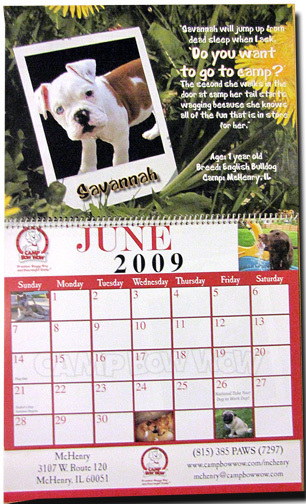 Back in 2009 Camp Bow Wow had a calendar contest where people from all over the country could submit pictures of their dog. After they were submitted people could vote online and the top 12 dogs would get to represent a month. Savannah was one of the hottest months. Obviously I submitted a picture of Savannah. I then reminded harassed everyone to remember to vote for her everyday. The voting was setup so that people could only vote from one IP address per day, but that wasn’t a problem for me. For the next month my 45-minute drive to and from work took nearly 2 hours each way. But it wasn’t because there was construction or traffic. It was because I had borrowed a laptop. I borrowed a laptop so I could stop at every free Wi-Fi spot to and from work to cast as many votes for Savannah as I possibly could. And, much to my surprise, she ended up winning and her picture appeared in the calendar that Camp Bow Wow sent to all of their national chains. I assumed her picture being shipped all over the country was going to be the crowning achievement of her career. That was until I got home tonight. It appears Jake has some connections as well and may have gotten Savannah a tryout for a national TV spot. Check out Savannah’s video here. Gallery | This entry was posted in Daily Life and tagged daily life, humor, Savannah. Bookmark the permalink. 3 Responses to What’s Next for Savannah? A Star on the Walk of Fame? You are dead meat, J-Wo! That was a mean trick, dude. Even though Savannah is cute as heck! Hahaha…. I know, it was terrible but it was funny. I think Savannah is adorable! !